Why not just make cake? My brother’s first words when this came out of the oven. Well, because you can eat chocolate bread for breakfast or snack without feeling the least bit guilty. It is, after all, just bread. With chocolate chunks. At least it’s a little healthier than cake – except for the part where you knead butter into the dough (but it’s just a little, so no worries). I bought a book of bread and baked-goods recipes (entitled Complete Baking) a while ago, but hadn’t tried anything out of it until today, mainly because everything in every recipe is in grams and ounces. I had some free time today so I whipped out a converter and finally gave this recipe a shot. I’m a sucker for all things Italian and since this recipe was Italian and included chocolate, how could it not be good? 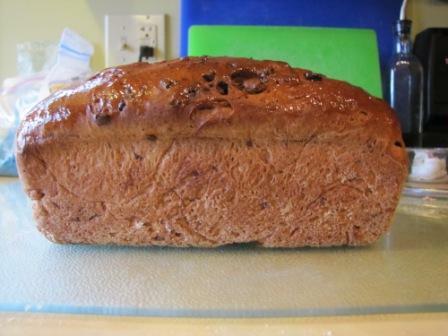 It’s not a very sweet bread, except for the bits of chocolate worked into the dough, and would go well with a sweetened cream cheese spread. It’s excellent plain, too, as we discovered. My only critique of the original recipe is that it needed more cocoa powder in the dough, so I increased the amount called for. 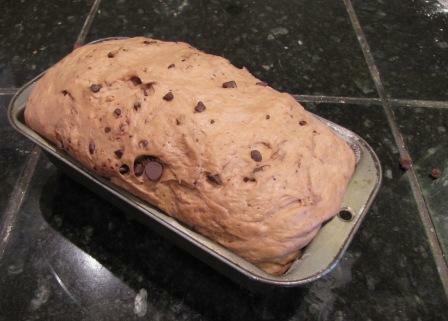 The bread still isn’t intensely chocolate-y but the chocolate chunks help. I haven’t tried this, but I am going to add a little vanilla extract next time. Seems like it might boost the flavor. Mix together the flour, cocoa powder, and salt in a medium bowl. Add the sugar and make a “well” in the middle. Combine the yeast with 1/4 c. of the warm water, then add it to the well with the rest of the water. Mix to make a dough (will be a little stiff at first). Turn out onto a counter or pastry board and knead into the butter until dough is smooth. I added just a touch more flour since the butter made the dough a little sticky. Put the dough in an oiled bowl, cover with plastic wrap, and let sit for 1 hour. After the hour has passed, punch down the dough and knead in the chocolate chips. Let sit, covered with plastic wrap, for 5 minutes. 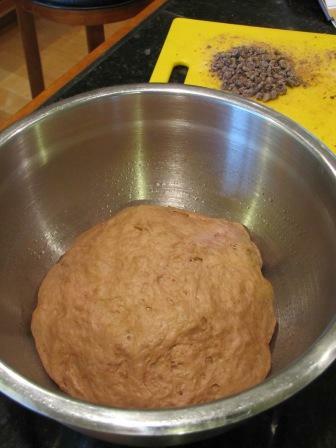 Shape the dough into a loaf shape and place in a greased and floured loaf pan. Cover with plastic again and let rise for 45 minutes. Bake at 425* for 10 minutes. Reduce heat to 375* and bake for another 25-30 minutes. As soon as it comes out of the oven, brush the top with melted butter and let cool. Or cut it right open and enjoy the bread steaming hot. Your choice. Tags: baking, bread, Italian, recipe, vegetarian. Bookmark the permalink.